Is it okay for a baby to sleep in a car seat? 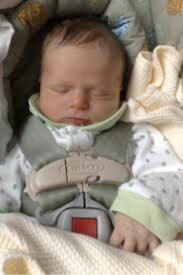 « Howard J. Bennett - Pediatrician and Author in Washington, D.C.
Is it okay for a baby to sleep in a car seat? Car seats are designed to keep babies safe in the event of a motor vehicle accident. They are not meant to be a substitute crib. However, everyone knows that babies commonly fall asleep during car rides. This happens because the vibrations and sounds inside a motor vehicle often lull the baby to sleep. The same thing happens when parents rock and shush their babies to help them relax. Because babies commonly fall asleep in the car, parents may let them finish napping in the car seat once they have arrived home. Although most doctors would not argue with the adage, “Never wake a sleeping baby,” it is important for parents to be aware of the dangers associated with sleeping in car seats. There are three reasons why most doctors discourage sleeping in car seats. It can make stomach reflux worse. If a baby refluxes while he is in a car seat, he is more likely to choke because he cannot extend his neck to clear the refluxed material. A baby can fall out of a car seat if he is not strapped in correctly. Also, an older sibling might accidentally push the car seat off a table or other raised surface. When a baby is strapped into a car seat, his head can fall forward onto his chest. If this happens, the baby’s airway may become compromised making it harder for him to breathe. A 2005 study showed that oxygen levels dropped in 18% of newborns who were strapped in car seats. Sleeping in a car seat for a long period of time may hurt the baby’s back or neck. This is an unnecessary concern. Babies are so flexible they do not get aches and pains after being in a car seat. A baby can become conditioned to sleep in a car seat. As a result, he may be unable to sleep in a crib when he gets older. There is an element of truth to this concern, especially when you consider that parents typically let babies sleep in car seats because they don’t like their crib. Keep your baby next to your bed so you can comfort him if he stirs during the night. Turn on a ceiling fan or a sound machine to help soothe your baby. This entry was posted in Dr. B's Blog and tagged safety.